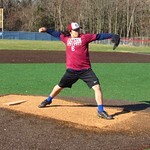 Eastern Regional soph Brendon Chin made his first varsity appearance as an ambidextrous pitcher on April 1, 2019, in a game at Bishop Eustace. Eastern Regional soph Brendon Chin displays his lefty style. Eastern Regional soph Brendon Chin.